The TRYCLOPS X - Purge Controller is certified for use in Zone 1 hazardous areas. The TRYCLOPS X - Purge Controller monitors purge pressure, exhaust vent flow, and controls electrical power and pre dilution purge time for one (1), two (2) or three (3) pressurized enclosures. 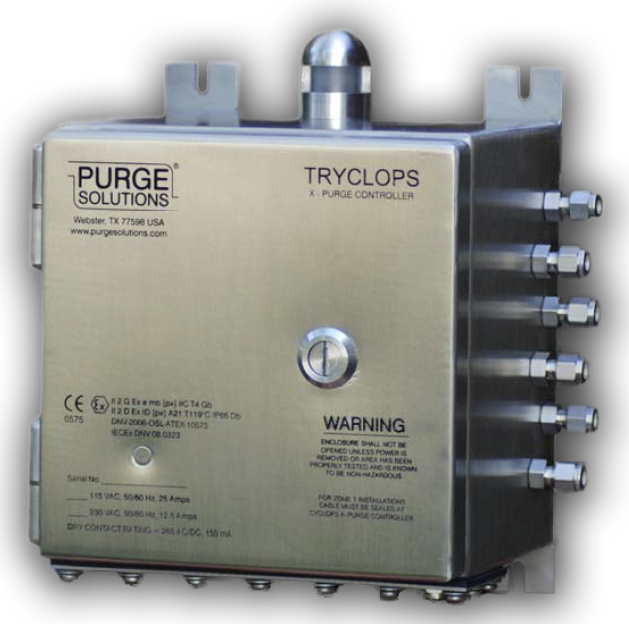 The TRYCLOPS X - Purge Controller provides local and remote objective evidence of the presence of positive purge pressure within the electrical equipment enclosure(s) and enclosure's exhaust port flow. When the monitored enclosure(s) registers a pressure of at least 0.30 inches of water column (0.75mbar) above the referenced atmospheric pressure surrounding the enclosure(s) being monitored and the exhaust port(s) is registering satisfactory flow, TRYCLOPS's local green LED indicator will begin flashing. An automatic dilution purge controlled time delay may then begin. The time delay can be set from one (1) to ninety nine (99) minutes, which is set by the customer to allow at least five (5) times the volume of free space in the enclosure to be exchanged before power is automatically applied by the TRYCLOPS X - Purge Controller to the electronic equipment within the enclosure(s) the TRYCLOPS is monitoring. After the automatic dilution purge time has elapsed, the local green LED indicator will stop flashing and go into a continuous green state. Indicating that the monitored enclosure(s) pressure is being maintained above 0.30 inches of water column (0.75mbar) and enclosure exhaust port(s) is registering satisfactory flow. Up to 25 Amps of power for 115 VAC units and 12.5 amps of power for 230 VAC units will then be automatically applied by the TRYCLOPS X - Purge Controller, eliminating the need for an additional explosion proof enclosure with a solid-state relay. The TRYCLOPS X - Purge Controller continuously compares the purge pressure inside the monitored electrical equipment enclosure(s) with respect to the atmospheric pressure surrounding the enclosure(s) preventing the ingress of flammable materials in the surrounding atmosphere from entering into the enclosure(s) as long as positive purge pressure and exhaust port(s) flow is maintained. If the enclosure(s) pressure should go below 0.30 inches of water column (0.75mbar) and / or exhaust port(s) flow stops the local LED indicator will go from steady state of green to a steady state of red, power will be disconnedted from the unprotected monitored electrical equipment and if used a dry-contact alarm for either situation, will be sent to the remote point for monitoring. Other features of the TRYCLOPS X - Purge Controller are a Maintenance Switch and Power Disconnect Bypass Switch. The Maintenance Switch is used when electrical equipment within the enclosure(s) being monitored by the TRYCLOPS X - Purge Controller requires electrical power for repair or maintenance. After the area surrounding the enclosure(s) has been tested and is known to be non-hazardous. The enclosure(s) can then be opened without protective purge pressure exposing the electronic equipment to its surrounding atmosphere. The TRYCLOPS X - Purge Controller's Maintenance Switch can then be put in maintenance mode and power will then be applied to the electrical equipment for repair or maintenance. During this time the local visual LED indicator will flash red and if used, the dry-contact will send an alarm to its point of remote monitoring. When repair or maintenance has been completed, the electronics equipment's enclosure(s) door can then be closed and fastened. Purge pressure can then be restored to the enclosure(s) and if the purge pressure remains above 0.30 inches of water column (0.75mbar) and if there is satisfactory exhaust vent flow, the Maintenance Switch when turned to normal operation, instead of going through the dilution cycle, the electrical equipments power will remain on. The Power Disconnect Bypass Switch is used to override the disconnecting of power to the electrical equipment within the enclosure being monitored by the TRYCLOPS X - Purge Controller for installations where immediate loss of power would result in a more hazardous condition. Power to the electrical equipment within the enclosure being monitored by the TRYCLOPS X - Purge Controller shall be permitted to be continued for a short period of time if both audible and visual alarms are provided at a constantly attended location. During this time the local visual LED will be steady state green and blink red. The TRYCLOPS X - Purge Controller monitors the purge pressure and exhaust flow from up to three pressure and exhaust vent flow points, which is specified by the customer and built by the manufacture at time of purchase. The TRYCLOPS X - Purge Controller was specifically designed for use with analyzers, mounts in the general area of the enclosure(s) it will be monitoring and comes standard with a purge exhaust vent for each enclosure the TRYCLOPS X - Purge Controller will be monitoring. The TRYCLOPS X - Purge Controller, is explosion proof (flameproof) comes in 14 gauge 316 stainless steel. The TRYCLOPS X - Purge Controller comes with voltage options of 115 VAC up 25 amps and 12.5 amps for 230 VAC unit. Purge Solutions, Inc. TRYCLOPS X-Purge Controller is certified to ATEX, IECEX and CE Mark standards or directives by third party notified bodies for use in hazardous areas worldwide.